Beard hair is quite different to head hair: it’s coarser, curlier, and doesn’t fall out as we get older! Comparatively little work has been done on the genetics of human hair colour, but it’s believed that in order to have a ginger beard, you must be a carrier for the recessive gene on chromosome 4. With two copies of this gene, you’ll have ginger hair all over, but with just one, the hair on your head will be brown or auburn and your beard will be ginger. When growing a beard, a brown haired man could be confused as to why his beard comes out ginger. The confusion, as mind-boggling as it seems, has a simple answer. It’s the result of science. We each receive genetic traits from both parents. We receive one set of chromosomes from our father and another set from our birth mother. As a result, the chromosome that produces ginger coloured beard hair has a high chance of becoming a part of your body’s genetic make-up. Contrary to what the general public may believe, your beard being a different colour than your hair is natural. It does not have to be dyed. However, you must understand what causes your beard to be different than your hair colour in order to be comfortable and confident with the opinions of others. How Does Chromosome 4 Work? Most scientists agree that the recessive gene for Chromosome 4 is the gene which causes ginger coloured beard hair. If you receive one of this gene, from either your father or your mother, then you’ll have a ginger beard with either brown or auburn hair. However, if you receive two of the gene, one from your mother and one from your father, then your beard hair as well as your hair on your head will be ginger. As a human, you have 46 chromosomes in each of your cells, which are divided into 23 pairs. 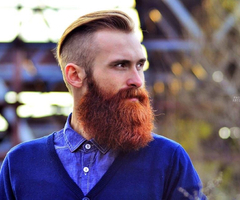 If you inherit the chromosome 4, you’ll naturally produce ginger coloured beard hair. Chromosome 4 covers approximately 191 million DNA building blocks while at the same time representing more than six percent of the complete DNA in all of the cells. Chromosome 4 is estimated to house between 1,000 and 1,100 genes which provide directions for producing proteins. The proteins produced perform a variety of roles in your body. Those proteins work together in your body and carry the specific instructions for producing ginger coloured beard hair. Out of the 23 pairs of chromosomes your body contains, the Chromosome 4 is the fourth largest of the pairs. It represents approximately 6 to 6.5 percent of the DNA in your body. In addition to being the primary chromosome which determines ginger coloured beard hair, chromosome 4 also is plays a large role in diseases such as a form of dwarfism which is called achondroplasia, as well as the connective tissue disorder fibrodysplasia. Chromosome 4 is 191 megabases long and contains 757 identified protein coding genes to date. A total of 54 of these protein encoding genes have been classified as cancer associated while 271 appear to be membrane proteins. However, in addition, 211 (just short of 28 percent) of the protein coding sequences do not have experimental evidence regarding the protein level. But What if I Do Not Want a Ginger Coloured Beard? If, for some reason, you’re dissatisfied with having a ginger coloured beard, there is only one solid way to change the colour – and that is to use hair dye! Since you cannot change your genetics and chromosomes, which would be the biological way of changing your beard colour, you can always use hair colour to make your beard portray whatever colour you desire. Of course, if using hair colour on your beard is not desirable for you, your only other option would be to not grow a beard and keep your face shaved smooth – which we’re against, we love beards. On the other hand, the primary concern any man should have regarding his beard, regardless if it’s ginger or any additional colour, is not specifically what colour your genetics have produced. The primary concern should be proper and adequate care for your beard because no matter what the colour, inadequate and proper tending to your beard will produce undesirable results. Check out our best stubble trimmer’s to keep that ginger beard at bay.